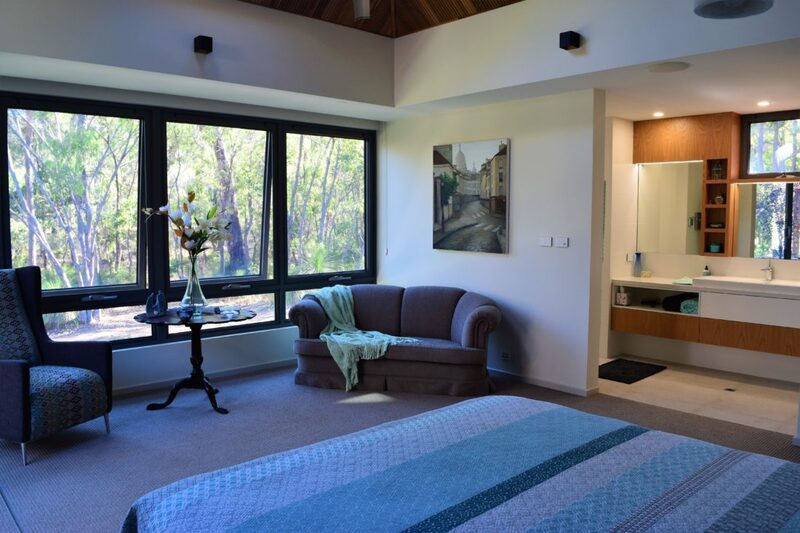 Extensive use of timber finishes hallmarks the house as it seamlessly blends with its bushland surrounds. 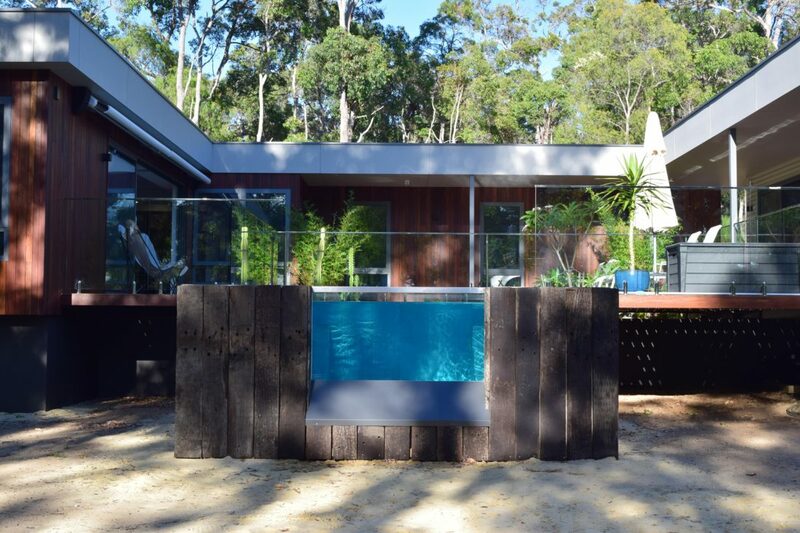 The house features extensive timber decking throughout matching the spotted gum cladding that covers the main module. This theme is continued inside with feature lined pyramids clad in western red cedar. The open plan kitchen/dining hides a concealed theatre room and custom made hidden cellar entrance located in the pantry. 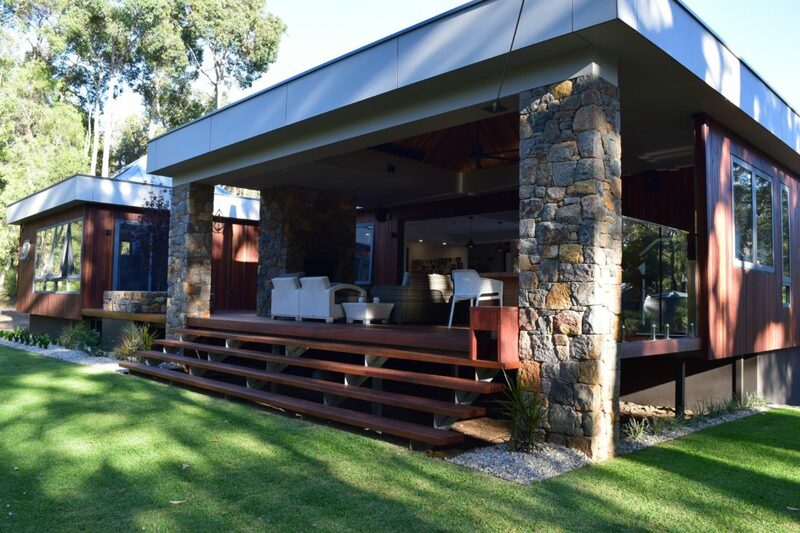 This custom home, situated in the hills of Dunsborough is both beautiful and striking. As Nick Goode’s own house it is a hallmark of the inventiveness and creativity Nick Goode Construction is known for. 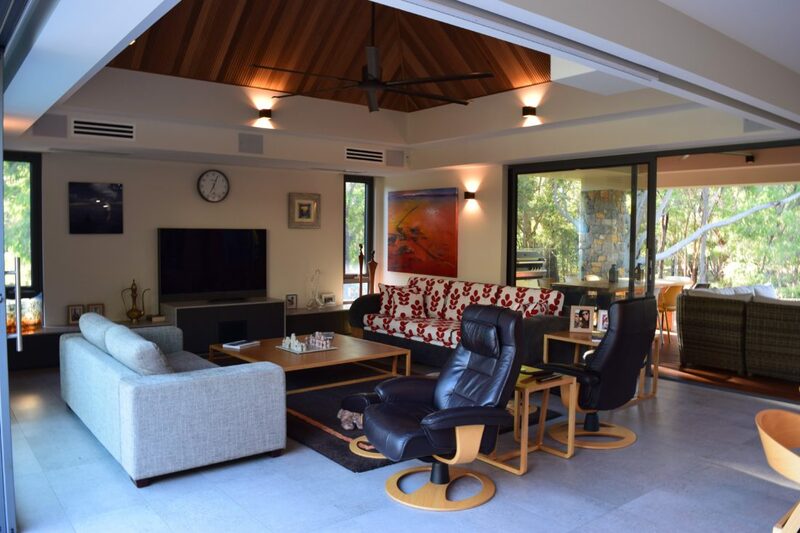 This Dunsborough home involved an extensive and varied amount of carpentry involved in finishing the project. 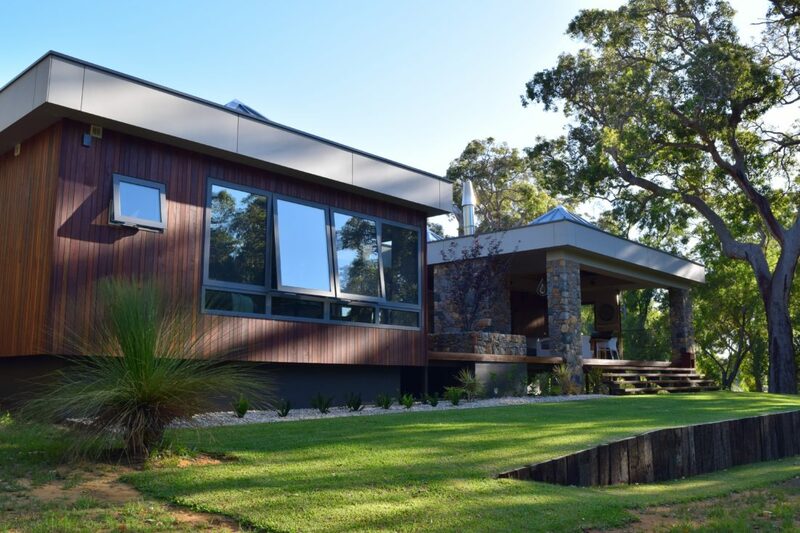 Both the exterior and interior of the house heavily feature timber finishes of a high quality. 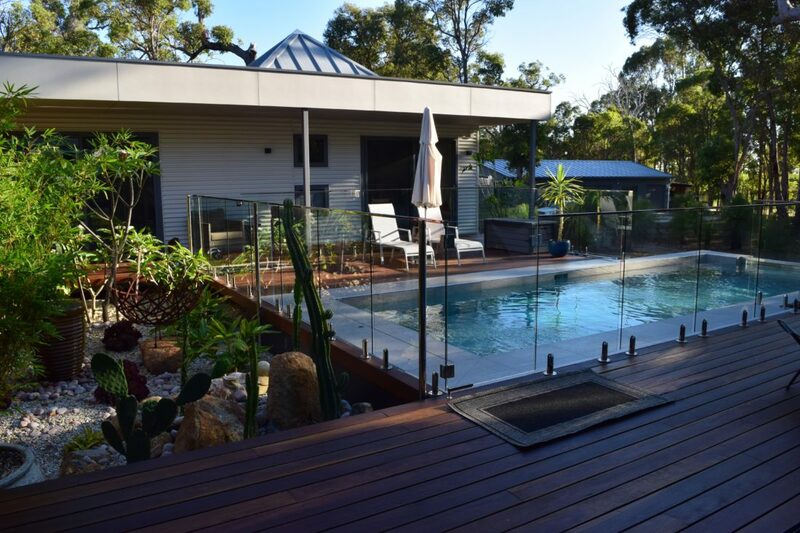 The exterior of the house incorporates widespread spotted gum timber decking covering a total of 164 square metres of decking and walkways both in alfresco walkways and open deck. The walkways are used to join the 2 modules of the whole house together. Matching the decking is the spotted gum cladding that surrounds the entirety of the main module of the house. The cladding uses varied widths as a feature creating added difficulty in its construction. Both exterior timber elements exhibit high end quality and craftsmanship. The complexity of completing the cladding using non-standard configuration cannot be understated. The Timber theme is continued inside in several forms. The house has several open feature pyramids situated in the roof of the living room, master bedroom and alfresco area. The pyramids have been lined with western red cedar for maximum effect. These were some of the most challenging parts of the project as it was vital that the alignment and detail of the pyramid and the lining were crucial to the final finish. The carpentry detail displayed throughout the house is one of its defining features. 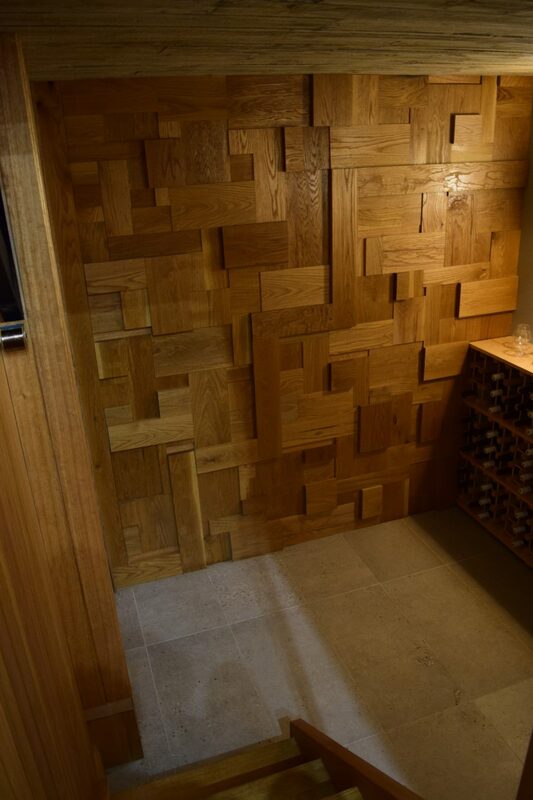 Feature walls in the powder room and cellar were created using American White Oak in an extremely non-conventional form to give the impression of a 3-dimensional finish. The doors were all custom made for the house and door details were custom made on site as well. The ceilings required extensive detail for the completion of the bulkheads throughout the house. The quality of these bulkhead finishes speaks to the experience of the tradespeople and ability to work on this custom project. In addition to the finish and detail of the bulkhead there was a high level of detail in concealing the blinds throughout the home. This was done to achieve an overall ceiling effect that contributed to the overall finish of the house. A custom build is as much about the finishes you don’t see as the ones you do. Ceilings are typically something people don’t associate with custom construction or as a bespoke product. These finishes can be the defining factor in the flow of a home. The ceilings create shadow lines and recesses that mask blinds, and bulkheads that create form as well as give function to the living areas.